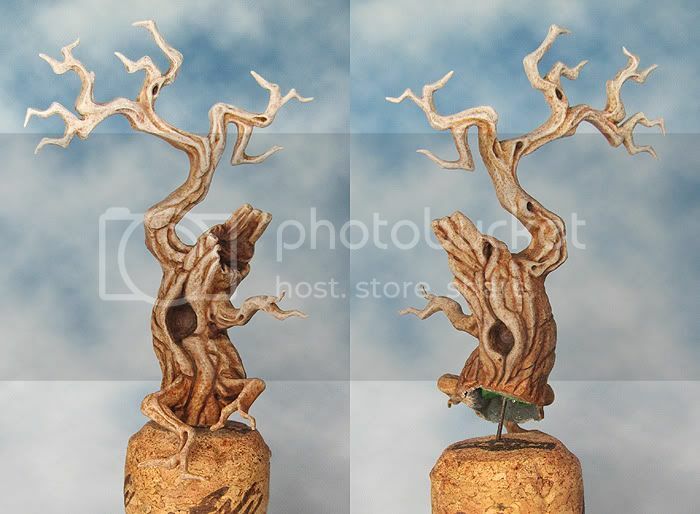 I’d initially settled for a design with a smaller tree stump and spent a fair bit of time putting it all together. To be honest I pretty much hated it on sight as I was making all the same mistakes over again. I needed to have the courage of my convictions and push the Dark Eldar element to the max. The tree had to go … I needed more monoliths! 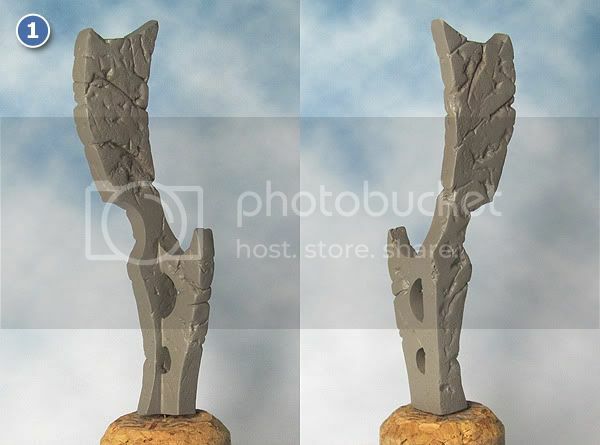 As I’d decided that the diorama needed another monolith I was able to take some pics of the progress so here is a Step by Step to painting the Dark Eldar Monoliths/Spires. A general mish mash of techniques is probably the best description. The effect is built up in layers using mostly dry brushing and washes. Mix Calthan Brown + Astronomican Grey. Any mid warm grey will do. Mix Base coat + Vallejo Grey Primer. An overall dry brushing with a lighter and slightly cooler version of the base colour. The aim is to bring out all the texture. I like to build up my washes with lots of layers so I dilute the colour right down and apply it in relatively thin coats. As I build up the intensity of colour I progressively darken the mix. I find this give me a fair amount of control on the overall finish. A selective dry brushing to begin to emphasize the raised areas. I used grey primer because it was to hand & I’m lazy that way! Any light cool grey would do the job. The highlights are building up with thin applications of diluted colour until the desired intensity is reached. I also went in with some ink and refined the shadows/recesses. The last week has seen quite a lot of progress on the new base for my Dark Elf diorama. It’s a good feeling to be building something again after the deconstruction of the old base. Having reassembled the monoliths into a single structure I then chose a 60mm resin cube to use as a plinth. 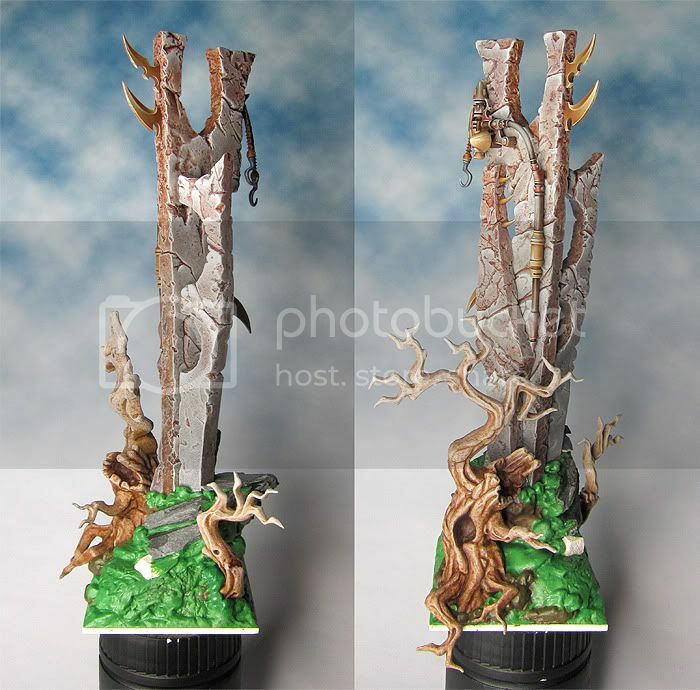 I’ve use bits from the Games Workshop plastic woods kit (left over from earlier projects) to make up an old stump. The various parts were then assembled on/into a rocky hillock made for the most part from green stuff. 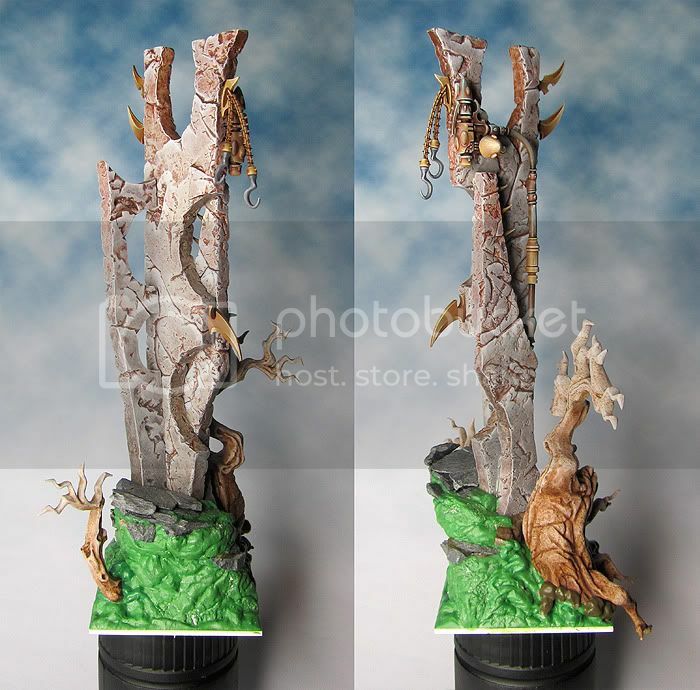 I’ve experimented with the tree stumps in an effort to get more texture onto the plastic kits. 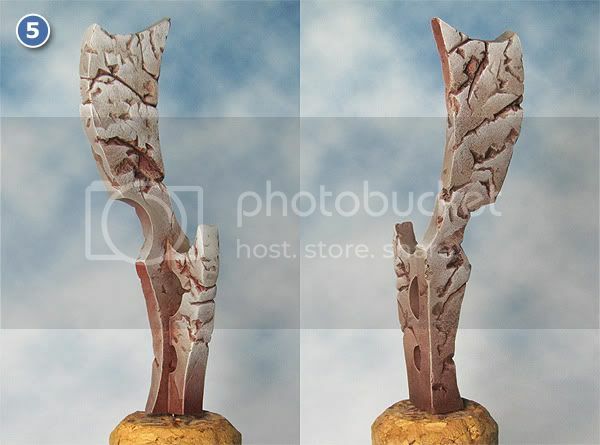 Once I had undercoated the stumps I applied a layer of crackle paint to them and then worked over this with a mix of dry brushing and washes. The finished effect isn’t bad but in the future I need to be bolder with it and really push the texture to the fore. For the moment the tree stumps are OK but they will need more work with texturing, painting and the application of leaves and moss. 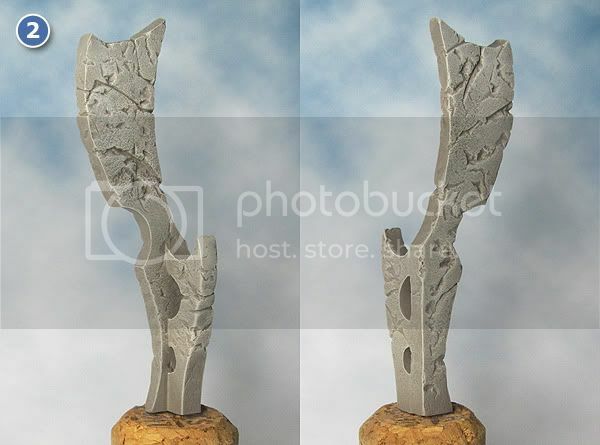 I’ll do this as a part of painting the overall base. I’m almost there with the basic assembly on the new base – just a little more work with the green stuff to hide the joins and it’s done. I’ve used an assortment of stones as texture stamps to get some texture into it and a few pieces of basing slate to give some harder edges here and there. 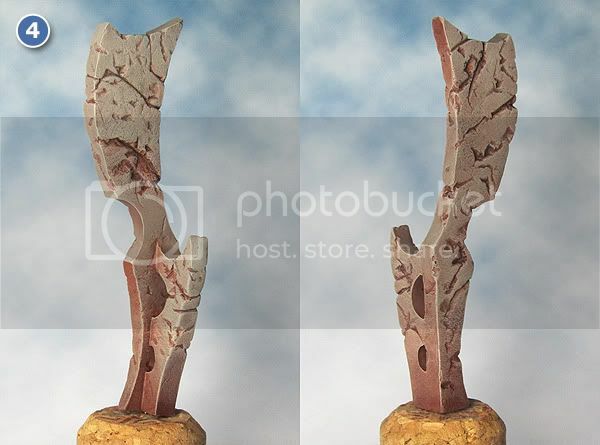 I had intended to incorporate some element of ancient Eldar ruins on the base. At the moment it looks to me like that might be a case of trying to include too much but I’ll see how things develop. There is a lot of painting and scenic detailing to add so I need to keep a certain amount of flexibility about the detail. One major development is my decision to give the base an overall bleak wintery theme. It looks like I’ll be seeing more than my share of snow and ice before Christmas! I've had this guy half finished on my desk for ages. Earlier this Summer I finally got around to getting him completed & based up. The colossus was a lot of fun to paint and gave me the chance to experiment with combining some new paint effects & techniques. I got the idea of painting coloured bands in the stone from a couple real examples - both are statues of Ramses II. 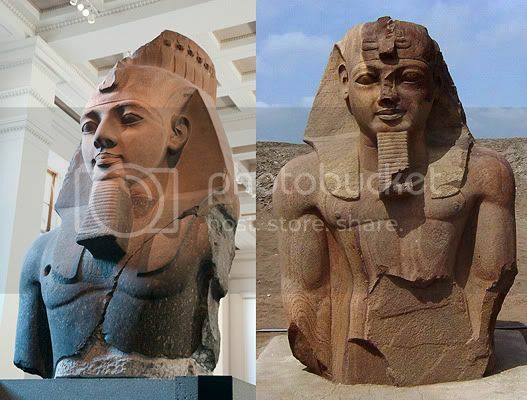 One is from Tanis and the other is the famous 'Young Memnon' in the British Museum. The paints were all from Games Workshop. 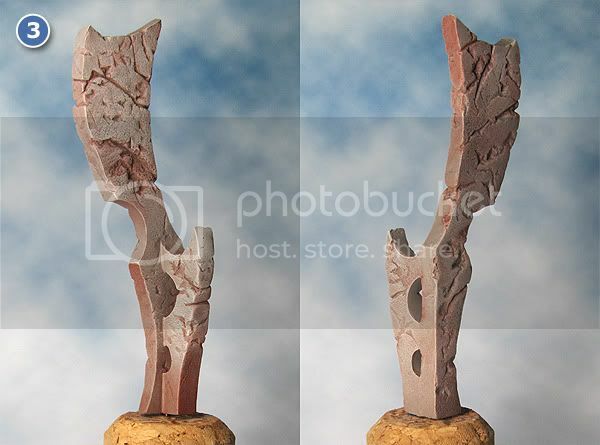 The base colour is Iyanden Darksun from the foundation paint range. I think (it was a while ago) that I may have mixed in a little Snakebite Leather to make the colour a bit less yellow. To highlight I just mixed in Skull White and dry brushed (lots). For the shading and bands of darker colour I used Scorched Brown and Bestial Brown in lots of layered washes. There are quite a lot of layered washes and dry brushing to bring out the texture. It’s then back to the highlight colour to pick out the detail and edges gradually adding more white to the mix. The metallic areas are Dwarf Bronze shaded with Scorched Brown. The verdigris is a mix of Hawk Turquoise and white applied as a wash and built up in layers. I’m a Graphic Designer and Illustrator, now retired, who has become a full time hobbyist. With the exception of a few years where I dropped out of the hobby I’ve been painting minis since I was in my teens. Over the years I've won a few trophies for my painting and five Slayer Swords but my quest to grow and develop as a painter continues - there is always something new to learn! Painting NMM armour - an illustrated guide. 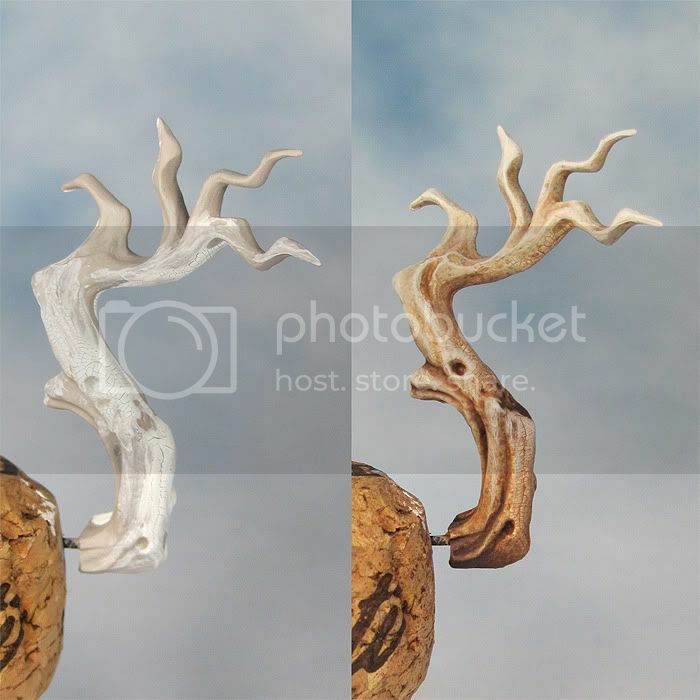 A step-by-step guide to adding slime and drips to a miniature.